For Executive Search Consultants, Recruiting Agencies, Manpower Recruitment Companies, Personnel Consultants, Etc. Finding candidates who match the qualifications specified by the employer is a tough task, but to gain its target audience becomes tougher. Make this task easy by creating an exceptional website with HeadHunter WordPress Theme that promotes your consultancy business online. 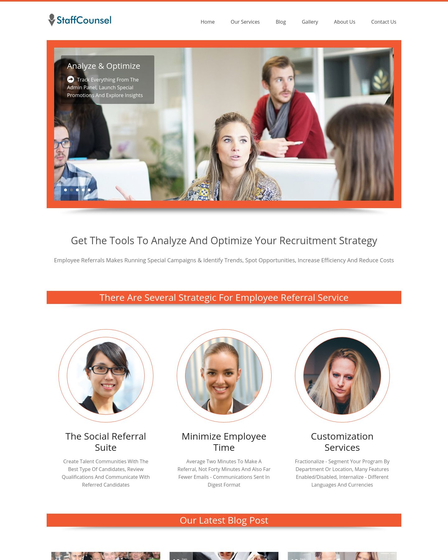 This WordPress theme offers you full-fledged features to advertise your headhunting services like sales recruitment, marketing recruitment & sales management staffing in a pleasant way. The template is best suited for executive search consultants, recruiting agencies, outsourcing units, manpower recruitment companies, personnel consultants, etc. 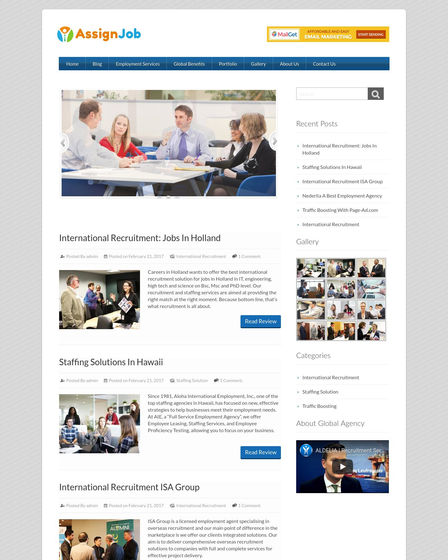 Share your latest job-related blogs with the users, demonstrate all your recruitment services & employment opportunities effectively by using Multiple Page Template of this theme. This will instantly hold the attention of the job seekers and enable them to find their desired job career options. It will further help you to increase your clients and convert them from visitors to customers. We already know that viewers hardly stay on one website, as they keep on looking out for more options until something strikes them enough. 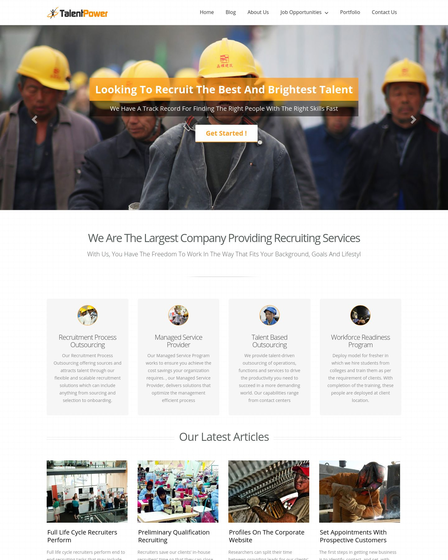 Unlike other websites, Headhunting WP theme offers you an exquisite one-page content feature to add an image along with the related content on the front page of your commercial site. It also offers you customize top header text to mention contact details of your firm and can give social links in the sidebar. 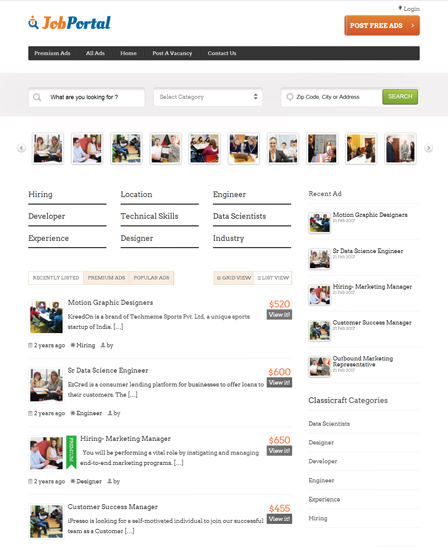 With Online Headhunting WordPress Theme you can create portfolio page using Full-width Gallery Page Template where you can showcase multiple images of your expert consultants, various recruitment activities, even the images of your clients who got recruited in different firms using your consultancy. 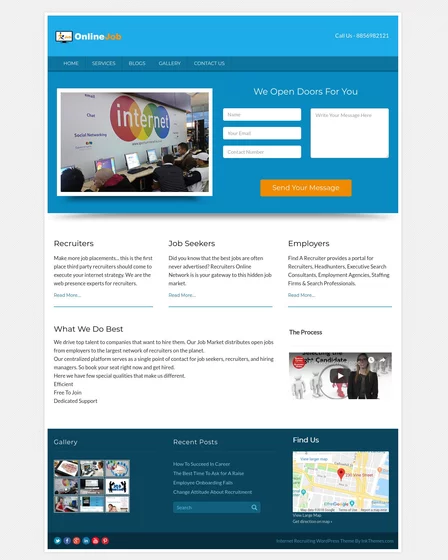 This theme allows your targeted customer to directly reach you through the inbuilt contact form so that they can easily message you regarding any information related to job queries. You can also create an About-us page to brief your visitors in short by providing company details and introduce them to the team members so as to show the authenticity of your enterprise & further help you to create trust in the mind of customers.